I was driving through The Peace Arch City just after the New Year to see how many people still had their Christmas lights and trees set up in the house and yard. As a child I always helped my mom take our decorations down, place them back in their boxes and put them way in the attic until the next year. I recall feeling sad that the festivities were over because school was about to start again. Even more importantly that little kid was often left wondering if holidays were really just about those decorations and buying then exchanging gifts with those relatives I traveled to visit one more time? When I turned down Third Street I saw in the distance a plastic nativity set, lights and wreaths still in place at one house. 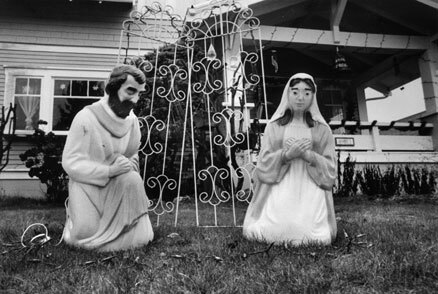 As I parked my car I became aware that in this front yard display the reason for Christmas was missing in action. Here Mary and Joseph knelt and prayed for the return of their holy child who had been abducted. Then I quickly saw the relevance to the paradox of keeping God the reason for all holiday observances (before, during and after.) The absent baby depicts our lost childhood awareness that God lovingly created everyone and everything in this world of ours.